We may not have hoverboards by October 2015, but thanks to investments from the California Energy Commission and Toyota, we’ll have something just as futuristic: the makings of a functioning hydrogen economy in California. That month, FirstElement Fuel will open 19 new hydrogen fueling stations in the state of California with $27.2 million in grant funding from the California Energy Commission and a $7.2 million loan from Toyota. Another 9 will open in the state through grant money distributed to other proposals from the state. With the number of hydrogen fuel stations more than quadrupling from the current 9, car companies will finally be able to release fuel cell vehicles with demonstrable advantages over battery electric vehicles. Toyota, for instance, unveiled its fuel cell vehicle concept (pictured above at this year’s CES) in Tokyo last fall and promises it will be ready for mass production next year. The car is about the size of a Camry and has an electric motor powered by a hydrogen fuel cell. Thanks to a high-pressure tank, it’s able to store enough hydrogen gas to drive for more than 300 miles without refueling — 40 miles more than even the highest-end Tesla Model S — with no environmentally harmful emissions. In a phone call, Toyota’s National Manager of Advanced Technologies Craig Scott explained that the technology for fuel cell vehicles has been ready for a few years now, but the infrastructure still wasn’t there to make them practical for most drivers. 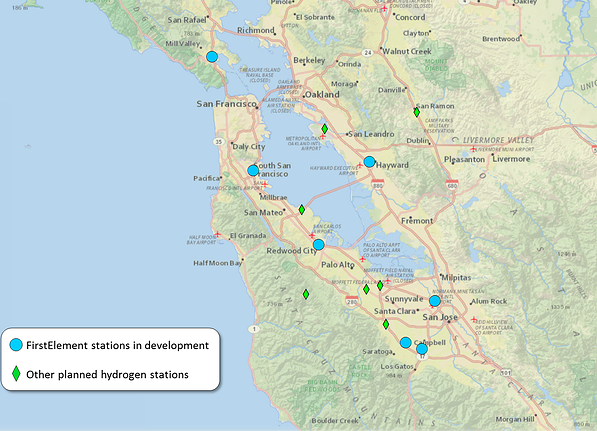 Even though their theoretical range is much further than electric cars with a battery, people simply wouldn’t be able to leave areas where hydrogen stations existed if they bought or leased one because the next station would be too far away. The simultaneous expansion of hydrogen infrastructure and the release of cars that can take advantage of them from Toyota, Honda and Hyundai in 2015 will have accelerating effects on the industry overall. Because of the availability of stations, Toyota is now able to move their hydrogen platform into mass production, which brings significant cost savings as the company can start bringing in parts from its other powertrains and build fewer parts “by hand” in limited quantities. What makes hydrogen vehicles so tantalizing is the fact that they can produce zero emissions with the range of a fossil-fuel-powered car. That zero comes with an asterisk, however: Some hydrogen is sourced in more environmentally friendly ways than others. If you’re using electricity from coal to turn water into hydrogen, it isn’t very clean. Ewanick says that 33 percent of hydrogen at FirstElement stations in Southern California will come from renewable biogas (the minimum required by the state), while 35 percent will come from the same in the northern half of the state. “We could spend a lot more to bring that up to 100%,” he says, but the prices involved wouldn’t work well for them or drivers. California wants to have 1.5 million zero-emission vehicles on the road by 2025, and it’s spending the money to make that happen. So far, its program to accelerate alternative and renewable fuels and technologies has invested more than $400 million in projects boosting hydrogen, biofuels, and electricity for transportation.